Kajal Kumari a young girl aged 19. The eldest sister in a poor family is having two younger sisters and a brother; all together they are five members in the family, all are grown up and it is very difficult for her parents to run the family and meet the educational needs of the three children. 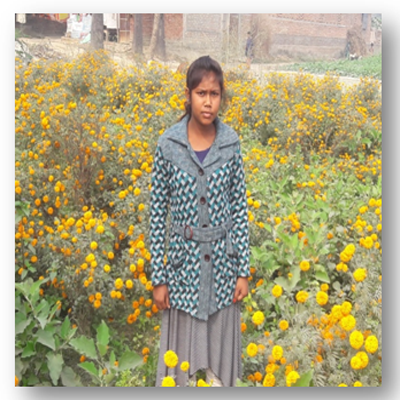 Kajal says ‘I felt that my education continuation may stop for the little amount. Though my parents supported me in continuation of higher education but being a labour they were not able provide me as much I required because of low income. I tried to do some work but being a girl I was not allowed to move out at distant places. My friends made fun of me. At last I found a way to make my dreams into a realty I was sure that this work will support me to study and also help my parents. After joining Ambedkar Yuva Manch of BDVS. I asked for the help of Rs 5000/- for doing floriculture in my land at the side of my home. Through the project I gained lot of skills, which proved to be of immense help to me. I also got help from my parents in some extent for land cultivation but above all I bore all the responsibility to the success. At last I got successes in my hard work. Though this is not daily business still then I earn Rs 6000/ to Rs 7000/ apart from my investment. During the time of Durga Puja and Diwali I sell some flowers where I get my investment, through that money I am continuing my intermediate in Acharya Narendra Dev College Shahpur, Patori and also supporting my parents. Now I feel I can do much thing for helping myself and my family. Earlier my parents thought that I am burden for them but now they love me and welcomed me. I convey my heartfelt gratitude to BDVS and youth group of my local community says the grown up girl from Patori village of Samastipur district.